It’s finally spring here in Northern Virginia. The temperatures are on the rise, and flowering trees are in full bloom. While we humans are certainly happy to climb out of another dreary winter, no one could be happier than the Northern VA region’s honeybees! You see, over the winter, the bees have been clustered in their hives, shivering enough to keep the colony nice and toasty…about 90 degrees. That kind of energy can make a girl hungry! As spring arrives, the higher temperatures and availability of pollen and nectar signals the queen to start laying eggs again. All winter, she has been holding back, but now the egg-laying engine shifts into high gear. In a matter of weeks, the population inside a beehive can increase exponentially. It’s like living in a nice little studio apartment then suddenly having a Brady Bunch situation. When the bees sense that they are overcrowded, it triggers their swarming response. (There is a lot more science involved with the dilution of the queen pheromone, but we’ll keep it simple). Swarming is how the honeybee reproduces and perpetuates its species and is a unique phenomenon in the insect kingdom. While other critters swarm – ants, locusts, mayflies, etc – they generally are doing two things…mating and eating. What is unique about honeybee swarms is that they do neither during the swarm. In a honeybee swarm, the colony simply divides and a half moves on to a new home. It all starts with a trigger. As already stated, that trigger is overcrowding. The bees do some magical stuff at this point. Some of the more experienced foragers will begin scouting for a new home. The builders in the colony start making special cells called “Queen Cups” that will turn into little incubation chambers for new queens. The old queen will lay eggs in these queen cups and as the eggs hatch, nurses begin filling the cups with Royal Jelly. Meanwhile, the scouts all convene and by using the waggle dance, they decide which is the best new location. Haha…like House Hunters – Beehive edition! After 5 days, the queen cells are capped and the queens begin to pupate or morph into the royal matron she will become. Queens will hatch in exactly 8 days after the cells are capped. Usually, 2 or 3 days before the new queens emerge, about 60% of the colony will start gorging on stores of honey and nectar in the hive to prepare for the journey. They do this because they need the energy to build new comb in the new digs. A day or two before the new queen climbs out of her cell, the reigning queen (can’t really call her “old”) leaves with the now well-fed 60%. In something of a bee tsunami, a literal tornado of bees, 20,000 to 30,000 honeybees leave en masse to start a new life in a new place. If you have never experienced a swarm, it’s really something of a marvel. Even experienced beekeepers find the occasion to be something in the realm of otherworldly. The bees will often start the journey by landing in a nearby tree or bush so they can gather the gang and head out. They will then sort of island hop to the new home. Keep in mind the queen is about 50% larger than the other workers, but her wings are the same size. Ole girl needs to take a break or two along the way! What To Do About a Honeybee Swarm? Honeybees are not aggressive insects. They are vegetarians after all! Usually, they only sting to defend their hive, and since swarming honeybees are homeless, they have nothing to defend. Besides, they are all fat and slow with a big belly full of honey. If you see a cloud of bees coming your way, don’t panic! Beekeepers love swarms. Swarms represent a colony of bees that are healthy enough to be overcrowded in the first place! These colonies often exhibit the qualities beekeepers want to retain within their own apiaries. Beekeepers will happily come and collect up a swarm of bees, bring them back to their own apiary, and give them a new home in which they can thrive. We of the funny garb and who smell of smoke call them “free-bees.” Don’t call an exterminator…call a beekeeper! Most beekeepers will gather up your bees free of charge, providing they are outside and in the open. Occasionally, honeybees, attracted to closed cavities, will find their way into rather inconvenient places such as your attic, soffit, tool shed, or BBQ grill. Look at it from a bee’s point of view. They find a large open space protected from the weather with a small and easily defendable entrance. What’s not to love about it?? If you suspect you have bees in your walls, again, call a beekeeper! Not all beekeepers are willing (or able) to open up your walls or floor to collect a hive. This service is usually not free either. Stay calm. Do not throw rocks or spray with poison! Try to identify if they are honeybees – usually, you will find a cluster the size of a basketball clinging to a branch or wall. Try to take a picture – beekeepers can quickly ID a honeybee from a yellow jacket. Contact your local Northern Virginia Beekeepers Association – Each state has a State Beekeepers Association and usually lists the local clubs. A basic internet search will do magic. If all else fails, call The Bee Store, and we can help. Expect a beekeeper to call and show up within an hour or so – with swarms, quick response is key! Just remember, swarming is how honeybees reproduce at the colony level. A swarm of bees comes from a healthy colony. Swarms are docile, even if it seems rather intense. Beekeepers will be more than happy to take care of these little critters for you, so don’t bother them if you don’t know what you are doing. Can I call The Bee Store for a Honeybee Swarm? Yes! 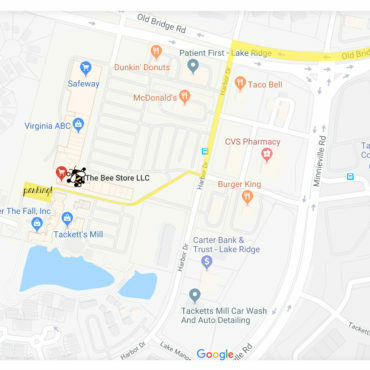 While we suggest contacting your local beekeeping association first, if you’d like to contact The Bee Store in Lakeridge, Virginia, we’d be happy to help you. You can stop by the shop located at 2230 Tacketts Mill Dr. D, Lake Ridge, VA 22192 or give us a call at (571) 398-0404. 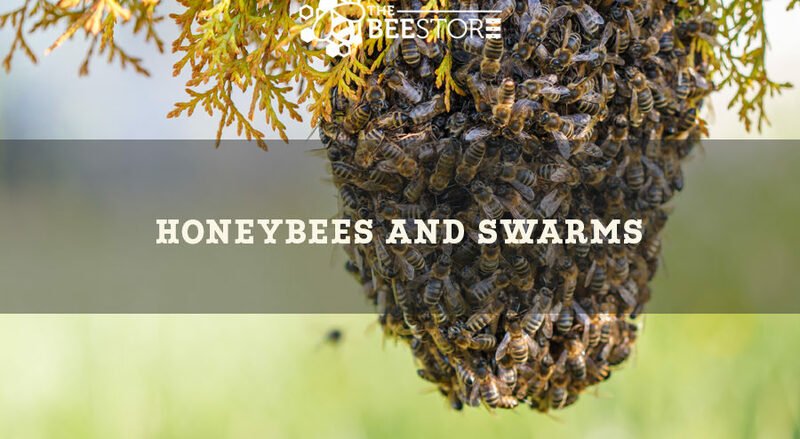 If all else fails, we’re monitoring our email at info@yourbeestore.com, so please do reach out should you encounter a honeybee swarm.